The Rottweiler (affectionately called 'Rottie') originates in the Roman Empire, where it was used to herd cattle. The name derives from the small town of Rottweil, Germany. The Rottweiler nearly went extinct in the 1800's, but today it has come back in popularity and is used as a police dog, guard dog, herd dog, and tracker. It is a very strong, courageous, seemingly invulnerable breed. Famous fictional Rottweilers include the puppet Triumph the Insult Comic Dog from The Conan O' Brien Show and the family pet in Ferris Bueller's Day Off. The Rottweiler is 56-69 cm (22-27 in) in shoulder height and weighs 38-59 kg (85-130 lbs). Rottweilers have a broad head with triangular ears, and a docked tail leaving several tail vertebrae. Rotties are built for strength and endurance; their bite force was measured by 'National Geographic' to be the strongest among all breeds tested. 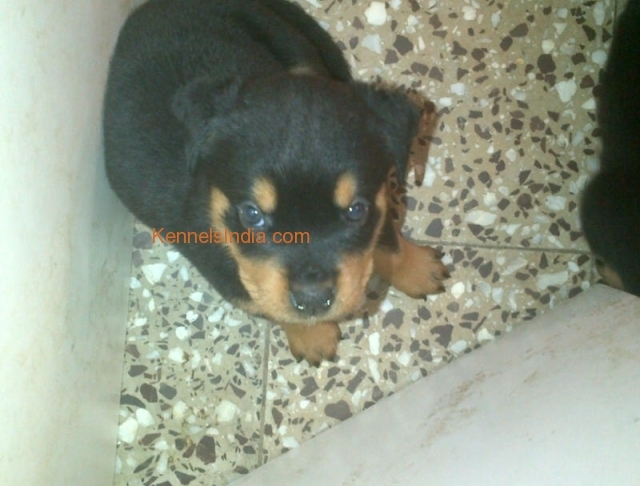 The Rottweiler has a distinct short, thick, coarse outer coat, with a thick under layer. It must always be black with brown markings. Occasionally there are long-haired Rottweilers, or Rotties with a white chest marking, but these traits are considered undesirable. The Rottweiler is brave, loyal, obedient, protective, watchful, and strong. It will risk life and limb to defend its family. Rottweilers are powerful and usually serious, requiring frequent attention. Rotties are often silent, observant, and serene, but females may bark more often than males. If properly socialized, a Rottweiler makes a good playmate for children and gets along well with cats and other household animals. This is all contingent on whether the dog has had positive experiences with them when young, however. The Rottweiler requires little coat maintenance; use a rubber glove to remove hair when the Rottie sheds. The ears must be kept clean, and the claws must be kept short. The Rottweiler enjoys cold or cool weather, but shelter must be provided. Rotties need frequent socialization. They tend to overeat and snore, so sharing a doghouse will probably be out of the question. 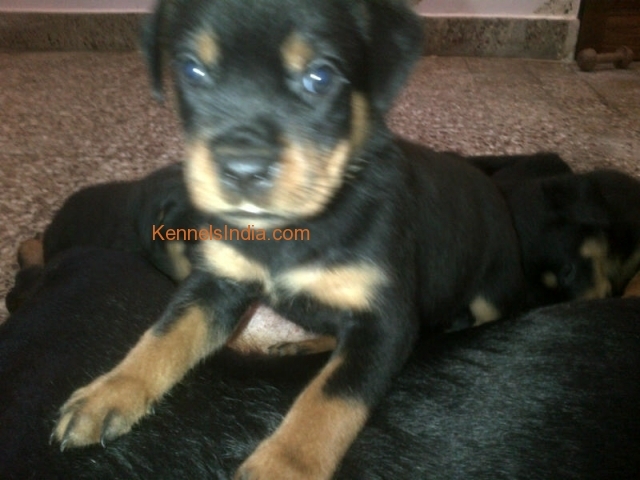 Rotties live 10-12 years and may have large litters of 12 or more puppies. The dominant nature of the Rottweiler makes it necessary that its trainer is calm, consistent, firm, and fair. Rottweilers are eager to learn, and obedience training is an absolute requirement. The Rottweiler is very intelligent and can excel at a variety of sports in addition to its capacity as a guard dog and watch dog. The Rottweiler requires daily exercise. Take it with you to run in the open country or the woods, as it does not wish to wander far from its family. Rotties also love to swim, run beside a bicycle, or catch a ball. Over exercising a Rottweiler is just about impossible, so have at it!